One more achievement in these times of bad news. Fiat can proudly say that it is the leader in one more segment in Europe during the first semester of this year, thanks to the 500L. Thanks to a strong demand in Italy and a good beginning in many European markets, Fiat has achieved its goal of enlarging not only the size of the popular 500, but its success as well. This small MPV gathers the best of the small 500 (design and personality), and mixes it with comfort and roomminess (after taking some rides, I can say it is really comfortable inside). The right positioning, pricing, and the good way Fiat has associated the 500L with the 500, has given the public a good message of how it can access to a larger 500 without losing personality. In the first semester Fiat sold around 32.000 units of the 500L in Europe-15 (Austria, Czech Republic, Denmark, France, Germany, Greece, Ireland, Italy, Netherlands, Poland, Romania, Slovenia, Spain, Sweden, and Switzerland). This may sound a low number compared to the brand’s production target (160.000 units this year), but it must be considered the fact that this MPV is just starting its commercial life in most of the European markets, and the offer is still very reduced. Besides, the Trekking and Living versions were not available in that period. The 500L was the best-selling B-MPV in Italy and Greece, and it occupied second position in Spain, Slovenia, and Romania. Italy was the biggest market for this kind of cars, with 32% of total analyzed. The arrival of the 500L boosted sales in this segment and favoured its competitors as well. France is the second largest market, closely followed by Germany. The UK, where the 500L is expected to be a success, isn’t included in this analysis (lack of data). 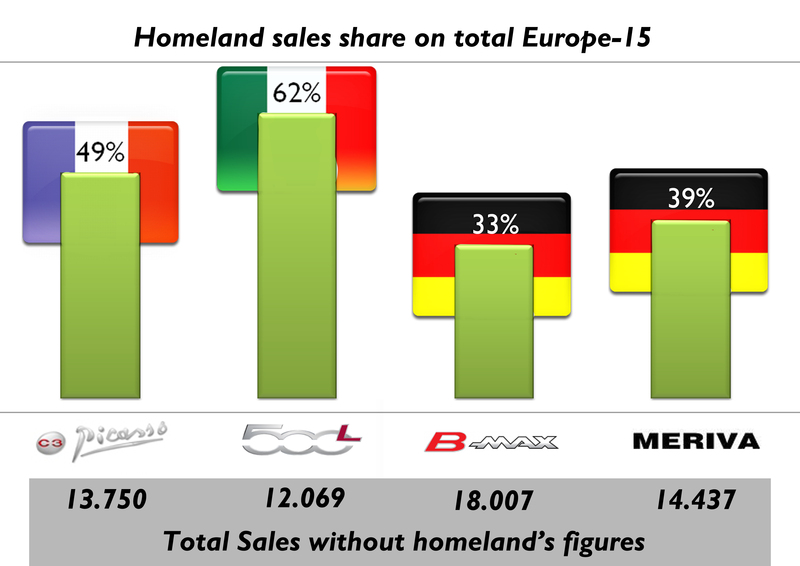 The importance of Italy explains part of the success of this MPV, as 61% of the analyzed sales took place in its homeland. It is a lot, and is something similar to the Panda’s dependence on its local market, while doesn’t follow the Fiat 500’s trend (Italy counts for 30% of its European sales). 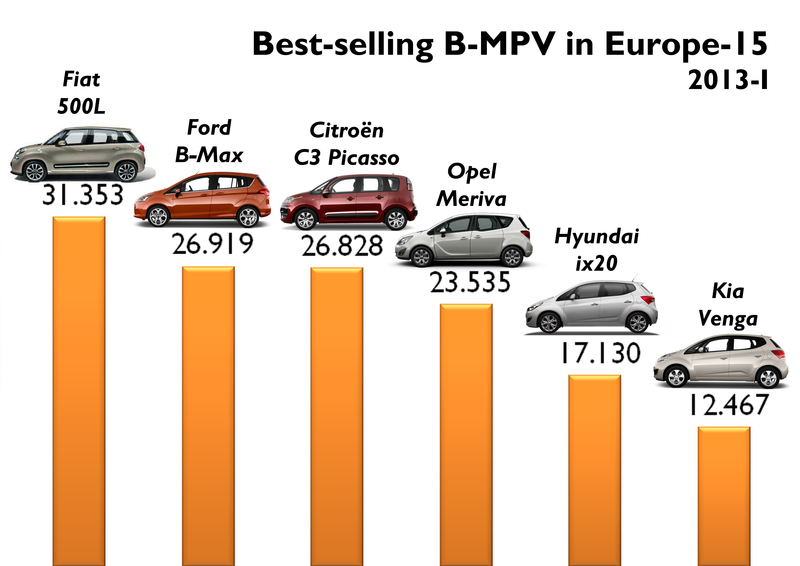 In the case of its rivals, the C3 Picasso’s sales in France counted for 49%, B-Max in Germany counted for 33%, while Meriva’s sales in Germany counted for 39%. Despite the 500L’s strong dependence on Italian market, I must say that it is a big market for almost all of the MPVs sold in Europe. This country was the second largest market for the Citroën, the Hyundai, the Opel, and the Kia. In terms of volume, the 500L is more than 4.000 units ahead of the second in the segment, the Ford B-Max, which is closely followed by the Citroën C3 Picasso. The Fiat controlled 23% of the market analyzed (Europe-15), while the new B-Max controlled 19,5% of it. The best market share of the Fiat was in Italy, with 43% of the 6 models sales. This market share is better than the 500 in A-Segment, and could be the best of the brand in Italy. In France, the Citroën controlled 42% of the 6 models sales, while the Meriva and B-Max controlled 30% each in Germany (over total sales of the 6 models analyzed). If their homeland sales aren’t considered, then the 500L occupies the last position with 12.069 units, while the B-Max comes as the best-seller as its sales in all countries are quite balanced. The Koreans have a good performance as well. The Hyundai’s sales are very well-distributed with 6 markets surpassing the 1.000 units barrier (France is not included as there isn’t official data for this model). The Kia fails in Spain, Slovenia and Romania, but leads in Poland and Sweden. It’s important to mention that these results take place in a non-VW presence in the segment. Europe’s best-selling car maker doesn’t offer any B-MPV yet, but things will change once they decide to bring to life the minivan version of the Up!. There is nothing confirmed yet, but I’m sure it won’t take long to see how this new VW will complicate things to all of these B-MPVs in Northern and Central Europe. 2013-I. The B-Max controlled 19,5% of total sales of the 6 models. It had the best market share in Romania, and the lowest in Poland. In France, the Citroën controlled 42% of the 6 models sales. 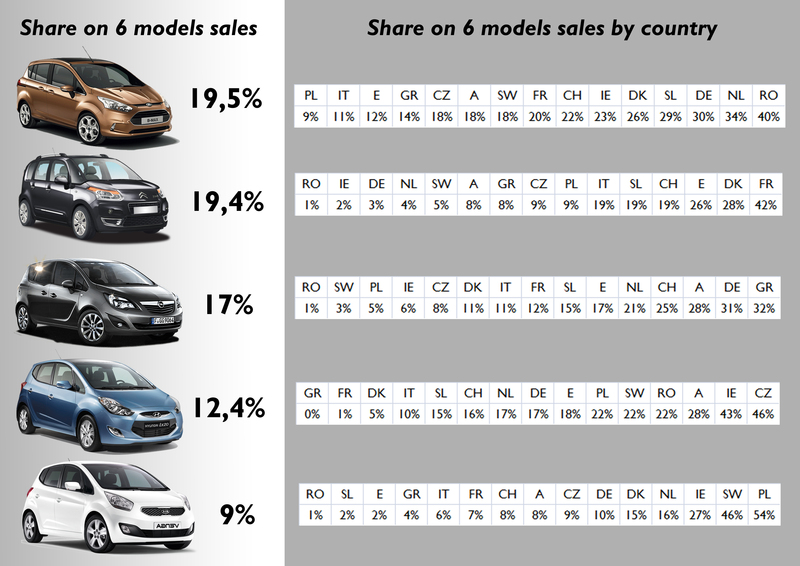 Notice that the Kia controlled more than half of total sales of the 6 models in Poland. A: Austria; CH: Switzerland; CZ: Czech Republic; DE: Germany; DK: Denmark; E: Spain; FR: France; GR: Greece; IE: Ireland; IT: Italy; NL: Netherlands; PL: Poland; RO: Romania; SL: Slovenia; SW: Sweden. Source: see at the bottom of this post. In June 2013, the Fiat 500L was the second best-selling B-MPV in Europe. The Citroën C3 Picasso and its amazing results in Italy, was ahead with almost 5.500 units, and 22% of the total analyzed. 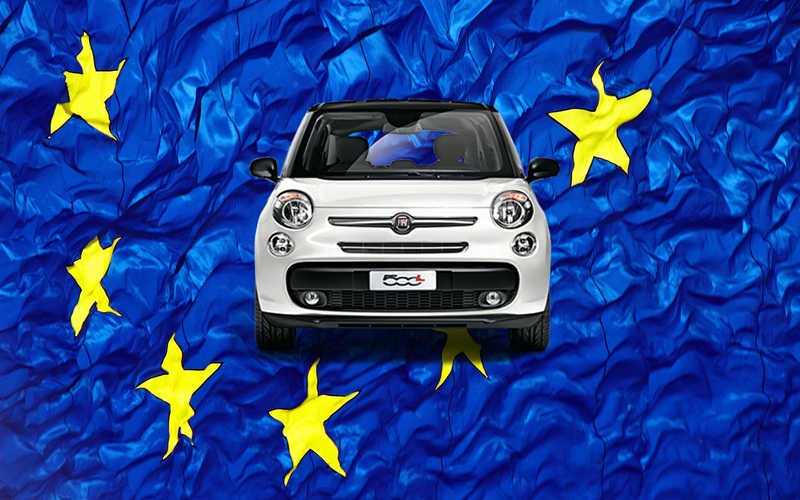 In May, the 500L lead the market with 25%. The reason for this change is Italy, the land of the 500L. The Fiat was first in its home land but lost some positions in the ranking and the Citroën gained a big part of the market share selling more than 2.000 units once again. In other words, the French MPV was less than 400 units behind the Fiat, and Italy counted for 38% of its sales in Europe-15. France counted for 46%. No one, not even Citroën’s people, would had tought that the C3 Picasso would have had the best times in Italy just after the arrival of the 500L. This is because of the big promotions that allow Italians to buy it at the same price of the regular C3. 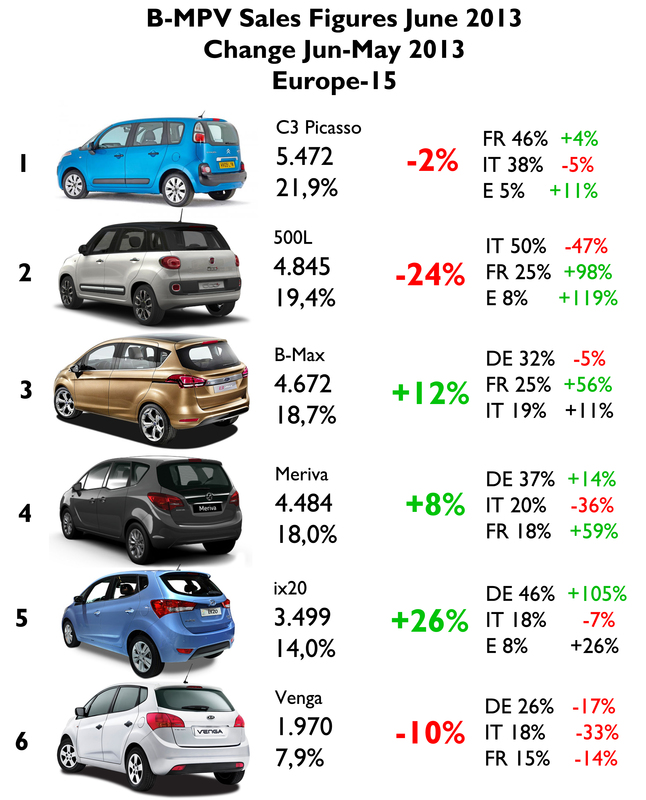 The 500L is ahead of the B-Max and Meriva, which had a positive growth on June/May 2013. 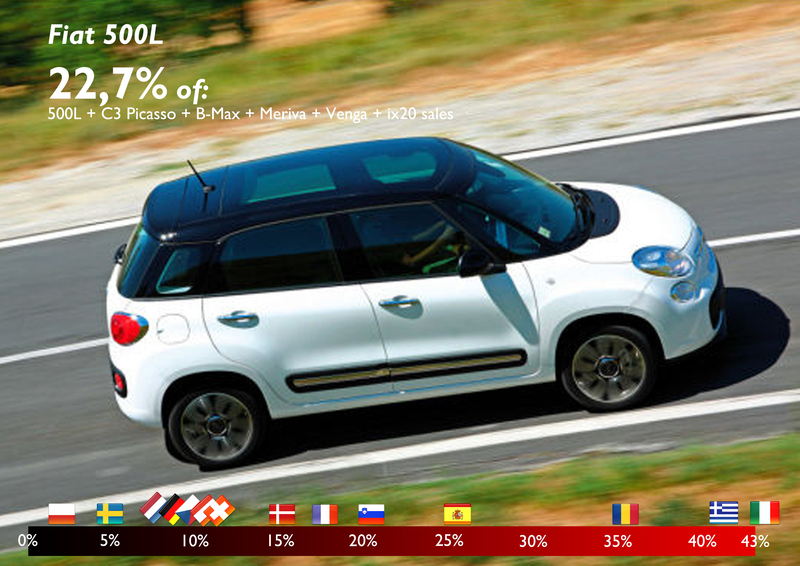 Even if its sales fell 24% on June/May 2013, the dependence of the 500L on Italian market decreased, which is not bad. Just as it happened during June, it is not clear which model is going to occupy the first position by the end of this year as Italian market keeps falling, and the B-Max will benefit from more healthy markets in the north, and the UK will be crucial for both models (the 500L is expected to hit the market following the success of the small 500, while the B-Max will play as a local). ← Chrysler 200 or Toyota Camry? Haleluja xD. About time. Let’s hope they keep it that way for as long as possible. 🙂 Hey Juan, do you know when is Fiat planing on buying the rest of Chrysler. I do believe, that is there primary job, or am I wrong? Yes, it is now the primary job for Marchionne. Fiat must complete the acquisition of Chrysler as soon as possible. In this way they will be able to concentrate and add some cash to its European division.